Hello Folk --- I'm taking a well earned holiday at Breanish in the Isle of Lewis in the Outer Hebrides off the North-West Coast of Scotland. If you're ever up this way, drop in for a chat. Our cottage is called Tulloch Ard, the most Southerly of about 10 in the village, with a great view over the Atlantic, St Kilda and the Flannen Islands. 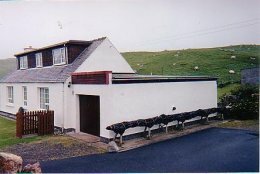 Here's our cottage, and click here to see a map of BREANISH village. There's tremendous walking along the coast, or if you're brave into the interior of the island, which is mountainous and very wild. Lots of birds for birdwatchers, including corncrakes, terns, wheatears, twites, sandpipers, sedgewarblers and greylag geese. There are very few people or cars, the nearest (and only) shop is 8 miles away and the nearest (and only) town 43 miles. When the weather is good, its heaven here. When its bad, I'm online to answer e-mails and complete the 1871 Census for this website! When our time at Breanish is over, we move 5 miles down the road to ARDROIL village. Here our cottage is larger, and two friends from Colchester join us for the last two weeks. 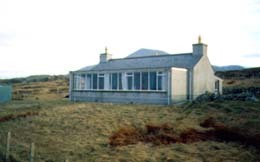 Behind the cottage is a very large sandy beach (Uig sands) surrounded by sandhills (in which the famous Lewis chessmen were discovered in 1831). The cottage is very well equipped and includes Sky satellite TV (because the nearby mountains prevent reception from terrestrial TV).